I wrote this for myself, so it’s not a commercial product. 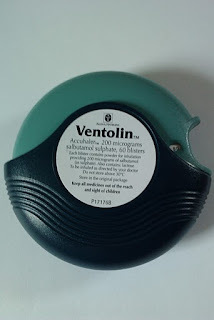 I’ve posted this after mentioning it on the Asthma UK forums, since it might be of use to some people there.The app (described here) is a simple way to keep track of how much medicine is left in your inhaler. 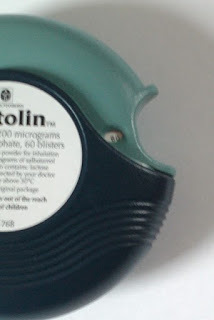 Some inhaler designs incorporate some sort of counter, but most don’t. Links to download are at the bottom of the page. This isn’t a business or commercial product, and I don’t make anything from it. I’m in no way affiliated with Asthma UK – I just happened to mention this on their forum. They do a lot of excellent public information and research work though, and I’m sure they could do with all the support they can get.There are two versions of the app: one for Java (which should run on most “normal” phones), and one for Android (“smart” phones). There is no support for iPhone or iPad. Personally, I’ve used the app on a Sony Ericsson W595 (Java) and a few HTC (Android) smartphones (Hero and HTC1s, as of Sept 2012). For Java, download the file and send/copy it to your phone, via Bluetooth, for example. Don’t try to run it on your computer. Most phones know automatically how to install the app and where to put it. Once that’s done, you should be able to find it alongside your other games and applications. On my Sony Ericsson, for instance, it’s in my “Applications” menu. This forum thread tells you how to install a Java game/app, and the advice is similar for most phones. If you’re really stuck, post a message on this blog and I’ll try to help you. On Android, download the file onto your phone. Run it, and the app should install automatically. Before downloading, you must agree to the legal stuff‘s license terms. Java: I agree to the license terms. Android: I agree to the license terms. I hope you find this useful. Feel free to leave a comment, but bear in mind that this is a free hobby project and isn’t related to my full time job. Stuff – yes, that’s the technical term. It’s free of charge – don’t pay someone else for it, or charge people to distribute it yourself. I retain the copyright – I own the legal right to update/change, distribute or withdraw the app, and this is absolute. Even if you’re not charging, you cannot redistribute the apps (for example, by putting copies of them on your website) without permission. Instead, just link to here and people can download the latest version for free. If you really want to redistribute a copy, contact me to obtain permission. There is no warranty. To the maximum extent allowable in law, I am not responsible for you using this app. It’s provided as a good-will gesture, because I found it useful for myself. It’s not a medical aid, and it’s not going to tell you how to treat or control your asthma. My professional liability means that I can’t guarantee this as a safety-critical system; and it should not be relied upon to save life. I subscribe to the British Computer Society Code of Conduct and Code of Good Practice, which govern my professional conduct and practice. I live in Scotland, in the UK. Jurisdiction for the licensing terms remains with the Scottish courts, so the law in Scotland applies to the licensing and copyright – not England and Wales. The Java app is Copyright Fraser McKay 2009. All rights reserved. The Android app is Copyright Fraser McKay 2010. All rights reserved. The term “software” refers to any computer program downloaded from Fraser McKay. The term “the author” refers to Mr Fraser McKay. The term “the user” refers to the person using the software, including anyone who downloads it. The term “mobile device” refers to any electronic device capable of executing the software. FITNESS FOR A PARTICULAR PURPOSE AND NONINFRINGEMENT. IN NO EVENT SHALL THE AUTHORS OR COPYRIGHT HOLDERS BE LIABLE FOR ANY CLAIM, DAMAGES OR OTHER LIABILITY, WHETHER IN AN ACTION OF CONTRACT, TORT OR OTHERWISE, RISING FROM, OUT OF OR IN CONNECTION WITH THE SOFTWARE OR THE USE OR OTHER DEALINGS IN THE SOFTWARE. The user may download and run one copy on each mobile device in their possession. All other rights are reserved. The user may not decompile, disassemble or reverse-engineer the software. Nobody except the author may make modifications to the software. The user may not sell or hire the software, or redistribute it in any other whether or not that would result in material or financial benefit to themselves. The software is distributed by the author free of charge. The author retains all rights and titles in regards to the software. Except for the rights set out in this license, all rights are reserved. The copyright is owned exclusively by Mr Fraser McKay. The user may not claim any ownership or authorship to the software, or any affiliation to the author. The author disclaims any warranty as far as is permissible by law. In any event, the author shall not be liable for any damages incurred through use of the software, except for a refund of any amount paid for the software. The software is not a medical product. It should not be relied upon as such. No claim is made as to its safety. This agreement may be terminated by the author at any time. At such time, the user will erase all copies of the software, any related computer data, and return all physical materials relating to the software to the author. If at any time any provision of this agreement is found to be illegal, unenforceable or invalid in whole or in part then the remaining portions of such provisions and other provisions of this agreement continues to be binding and in full force and effect. The foregoing constitutes the entire agreement between the author and the user with respect to the software and supersedes and cancels any prior representation, understanding and commitment (whether oral or written) between us with respect to the software. The terms of this agreement may be updated from time to time, with notice placed at www.frasermckay.co.uk. This agreement shall be governed and construed by Scots law, and by accepting this agreement, the user agrees to submit to the exclusive jurisdiction of the Scottish Courts. As per a post on Asthma UK, I’ve uploaded a free copy of a mobile phone app that I wrote for myself several months ago. I have fairly serious asthma, and over the last few years, I’ve had to use several different types of inhaler. Some (see below) have counters that tell you how much medicine is left, but traditional “puffer” ones don’t – I was a bit fed up with this. 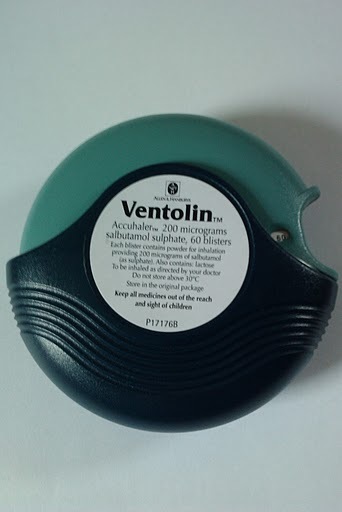 The most popular, “traditional” type of reliever inhaler contains 200 doses, but has no counter on it. Compare this to my Accuhaler, which tells me that there are 60 doses remaining (counter zoomed in to the right-hand image – that little white oval window next to the thumb rest). As a programmer, I was surprised that there was no easy phone app to keep track of my remaining doses. So I wrote one. There are two versions: one for Java phones (if your phone can download and play Java games – most phones can); and one for newer Android phones. Unfortunately, there is no support for the iPhone – I’d have to pay Apple silly money for the privilege, and this isn’t a business. The app itself is fairly simple, and both versions look similar and have the same functionality. When you take a dose, press (or touch, on a touch-screen phone) the appropriate button and the counter will go down. 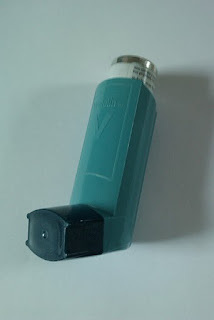 If you want to reset or edit your inhaler (as when you switch to a new, full, inhaler). The app might look slightly different on each handset, but the picture below is from a generic Android phone. To download either version, read this. I’ve received my results this week, and have achieved a first-class honours degree (BSc Hons). I’m also awaiting the verification of my MBCS status after upgrading from being a student member.